Applications are now open for a new ACT rural grants project that will support ACT rural landholders to adopt innovative sustainable farming practices, improve soil and pasture health, increase groundcover and prepare for drought, Director-General of the Environment and Sustainable Development Directorate, Dorte Ekelund, announced today. “Over the next three years, the ACT Government will offer a total of $450,000 worth of grants through the ‘ACT Rural Landholders Taking the Next Step’ project,” Ms Ekelund said. 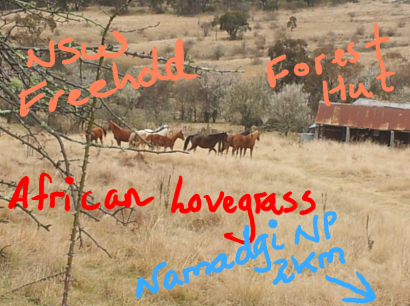 These photos show African Lovegrass on the move. 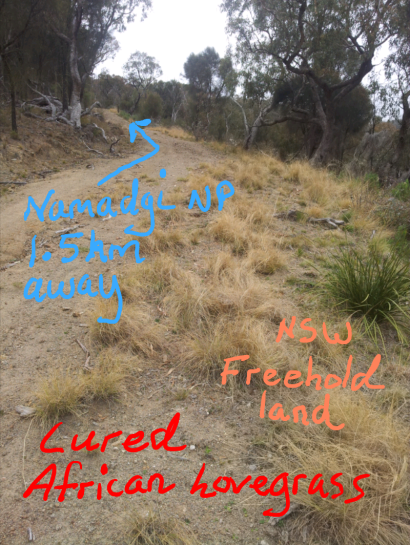 Fortunately the Namadgi Rangers are on to this problem. Photos courtesy of ACT Parks and Conservation Service. Planned activities: Planting trees and shrubs, doing cut & daub on woody weeds, continuing erosion control work. Stay for a swim afterwards if the weather's warm. Planned activities: Planting trees and shrubs, doing cut & daub on woody weeds. Stay for a swim afterwards if the weather's warm. Please wear suitable clothing, especially long sleeves, sun hat, sturdy footwear, and strong gardening gloves. Bring a day pack and do carry water. For more information about IRMMM, see the Isaacs Ridge Mount Mugga Mugga Parkcare group page. Interested in learning more about herbicide application? Are you a landholder in the ACT or in the Googong or Upper Murrumbidgee catchments south of the ACT? Are you working with herbicides as a Park Carer/landcarer in the ACT or in the Googong or Upper Murrumbidgee catchments south of the ACT? If you fall into any of these categories and want to upgrade your chemical application skills, ensure your machinery is working correctly, enable up to date records and gain accreditation or reaccreditation then read on.